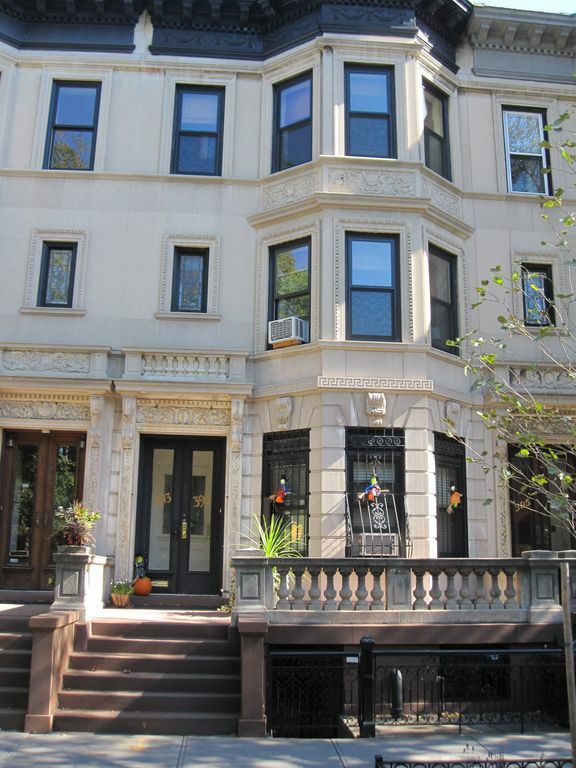 Spacious Lower Level Flat in Stuyvesant Heights Brooklyn - 20 Min to Manhattan! 2017 Greenest Block in Brooklyn Award Winner! 1,025 sq ft. Lower Level in a landmark designated historic limestone private house. Newly renovated and includes a private outdoor patio garden, full washer & dryer, free Wi-Fi and two HD cable televisions. Steps away from the Express A Train to Manhattan. Close to coffee shops, restaurants and grocery stores. Extended stays welcome...Just email me! Newly renovated full bath with complimentary toiletries. Wash & Dry your clothes with complimentary detergent. Professional grade two burner stovetop. The kitchenette is well stocked with complimentary tea and coffee. It also includes pots, pans and silverware. table and chairs seats six. Guests have full access to private outdoor patio w/ table and seating for six people. There are two roll away beds available in the closet of this apartment. The apartment can accommodate six as follows: 1. Queen sized bed in the bedroom - 2 2. Queen sized bed that converts into a couch - 2 3. Three roll away twin beds - 3 Please note: two sets of linens are provided for each bed. Amazing accommodations. Amazing host. Terrific location. We truly enjoyed our stay and didn’t want to leave! We will be back soon. Thank you. We, as in 4 adults stayed in Jason's property in Brooklyn, we loved it!! The apartment was big, spacious, neat tidy, very clean. Jason provided everything we needed, we did not want for anything. It is only a walk down the street to the train, and a couple of blocks to cafe's and restaurants. Any time I contacted Jason he replied promptly and always had the right answer and was so helpful. I would recommend the property 100%. Thank you Jason very much for making our 5 day stay in Brooklyn/NYC a great holiday. We really enjoyed our stay. The apartment was fully loaded with all the things we could possibly need. Jason was amazing. Very informative and polite. Train station to NYC is a 3 minute walk and very easy to get back from the city also. VERY quiet neighborhood and great restaurants in the area. I recomend peachies. Jason we appreciate you and look forward to staying again soon. Really enjoyed our stay. Jason is very welcoming and willing to help with questions and suggestions. Apartment is located in nice neighborhood that is located close to every type of restaurant and literally across the street from the subway. Apartment is clean and super efficient. Again, well worth the money. Great apartment, great location. Even while away himself, Jason was very responsive and helpful. The apartment was as advertised -- clean and spacious. In a great neighborhood with plenty of good places to eat and only one block from the train, it was a great base from which to explore Brooklyn and Manhattan. We'll go back!